What a mess! If the people who are meant to take care and protect the citizens -can’t take care of themselves, then there is a big cause for alarm. According to reliable reports, this Police officer identified as Inspector Musa Bashiru was found heavily drunk with local gin while on duty. 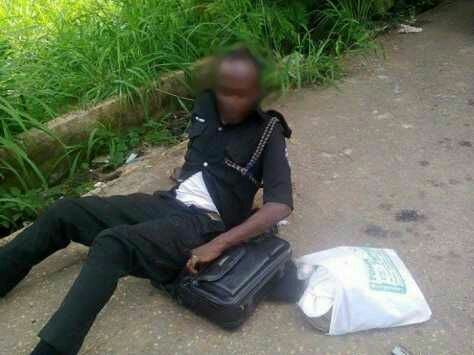 He was lying in pool of urine and faeces around the entrance of Christ Girls School, Ado-Ekiti on Friday April 8, 2016.